Oil on canvas, 60 x 75 cm. 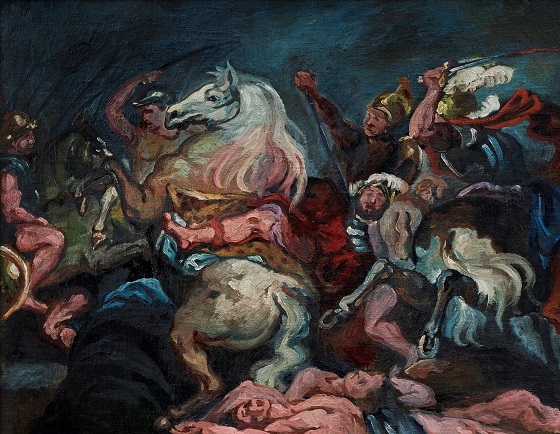 This painting depicts the Roman consul Decius Mus’ death during the Third Samnite War at the Battle of Sentinum (295 BC). The Consul has just sacrificed his life to the gods in battle (devotio) in exchange for granting the Romans a victory. As he is pierced by a soldier’s lance, he directs a final, terrified look towards the heavens before hitting the ground and joining the rest of the fallen. The painting is a paraphrase of Ruben’s The death of Decius Mus. The clearly curved brush strokes became a characteristic feature of Lundstrøm’s paintings in his so-called “curly” period. During this period, the strictly Cubist idiom was replaced by a freer and more expressive dynamic and motion. This new expressive style was particularly manifested in the artist’s depiction of people, which often appears inspired by Rubin’s bulky and distorted shapes.